A total of 25 Tasks need to be completed in order to unlock and recruit Black Bolt. 1. A.I.M.-less - Defeat 5 A.I.M. Soldiers. Remove A.I.M. from this equation. A.I.M. Soldiers can be found in Mission 1: Tribute or Gauntlet. 2. Mean Green - Defeat a Mini-Boss in Mission 1. Defeat either Abomination or Green Goblin in Mission 1: Tribute or Gauntlet. 3. Strength in Numbers - Use 2 Distress Calls. You can only receive Distress Calls by visiting allies. Add allies to help you win more battles. 4. Keep the Peace - Complete a Deploy. More help is needed on the ground to get the civilians clear of the area. Complete a Deploy in Mission 1: Tribute or Gauntlet. 5. Darkest Before Dawn - Defeat Proxima Midnight. The first confrontation with the Black Order is against their greatest warrior. Proxima Midnight is the Boss of Mission 1: Tribute or Gauntlet. 6. Always Watching - Research the Vigil of Attilan in the Lab. Research the Vigil of Attilan to complete this task. 7. The Mad Titan - Complete a Battle with Thanos. Fight Thanos either on your own map or on your friends' maps for free. Thanos respawns every 72 hours. 8. Demonic Diversion - Defeat 6 Demons. Demons can be found in Mission 2: A Strange Twist. 9. Mission Accomplished - Get 2 Stars of Mastery in Mission 1. Complete missions to add points to your cumulative score. Achieve a high enough score to earn a new Mastery Star! 10. Bolt From The Blue - Use Black Bolt's Royal Flight 3 Times. Royal Flight is Black Bolt's second ability. 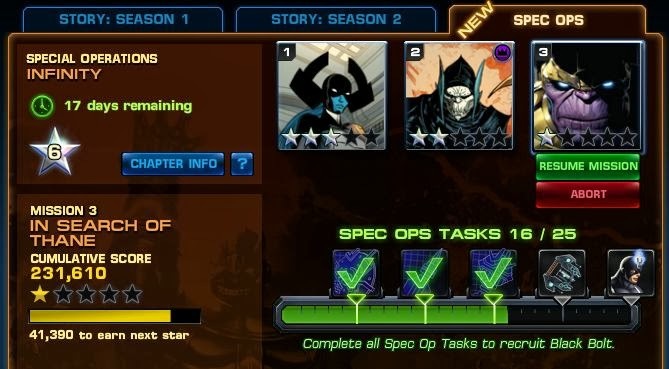 Black Bolt is a Team-Up in Spec Op 13 Mission 2 and 3 (keep in mind it has a 2 round cooldown). 12. Versus - Fight 5 PVP Battles. Compete in PVP to test your skills against other players. Hint: Practice matches count as battles. 13. Curbing Corvus - Defeat Corvus Glaive. The second confrontation with the Black Order is with the cruel and cunning Corvus Glaive. He is the Boss of Mission 2: A Strange Twist. 14. Sibilant Strike - Use Black Bolt's Whisper 2 Times. Whisper is Black Bolt's third ability. Black Bolt is a Team-Up in Spec Op 13 Mission 2 and 3. 15. Instability - Collect 20 Unstable Iso-8. Unstable Isotope-8 can be found in normal combat, as well as rewards from deploys and boss fights. You can also get some from your friends! 16. Hammer out a Warning - Upgrade the Attilan Cudgel to the Attilan Mace in the Lab. The Attilan Mace can be researched after acquiring the Attilan Cudgel. 17. Eternal Struggle - Fight Thanos 3 Times. Fight Thanos either on your own map or on your friends' maps for free. Thanos respawns every 72 hours. 18. Binary System - Get 2 Stars of Mastery in Mission 2. Complete missions to add points to your cumulative score. Achieve a high enough score to earn a new Mastery Star! 19. Righting the Wrongs - Use Dr. Strange's Teresing Boost 2 Times. Teresing Boost is Dr. Strange's second ability. Dr. Strange is a Team-Up for the Epic Boss of Mission 2: A Strange Twist. 20. Victory - Win 3 PVP Battles. Compete in PVP to test your skills against other players. PVP requires completing Chapter 1 Mission 4 of Story Mode. 21. Voxquake - Use Black Bolt's Power Word in Combat. Power Word is Black Bolt's fourth ability. Black Bolt is a Team-Up in Spec Op 13 Mission 2 and 3. 22. What's in the Box - Collect 5 Inhuman Lockboxes. Collect lockboxes to unlock Thane as a playable hero. They can be earned from fighting Thanos or lockbox sidequests. 23. Running the Gauntlet - Defeat Thanos. Thanos is the Boss in Mission 3: In Search of Thane. 24. Mission Accomplished - Complete 3 Stars of Mastery in all Spec Op 12 Missions. Complete missions to add points to your cumulative score. Achieve a high enough score to earn a new Mastery Star! 25. Dark Dread - Defeat Dormammu. Dormammu is an Epic Boss in Mission 2: A Strange Twist. HINT: Participate in Deploys as soon as they appear (Psylocke, Red Hulk, and Wasp are needed for Deploys). 1. Who's The Boss - Defeat 4 Mini-Bosses. Defeat any 4 Mini-Bosses in Spec Op 13 (can fight them with boss to save on Isos). 2. Seal the Deal - Use Thane's Sealing Touch 3 Times. Sealing Touch is Thane's first ability. Thane is a Team-Up in Mission 3: In Search of Thane. 3. See You Later Instigator - Defeat 5 Instigators. Instigators can be found in Mission 3: In Search of Thane. 4. Out of Order - Defeat Thanos with a Score over 70000. Thanos is the Boss of Mission 3: In Search of Thane. Achieving this score may require Thanos to be fought with Proxima Midnight and Corvus Glaive in the same combat. 5. A Date With Death - Fight Thanos 5 Times. Fight Thanos either on your own map or on your friends' maps for free. Thanos respawns every 72 hours. 6. Completionist - Complete 4 Stars of Mastery in all Spec Ops 13 Missions. Complete missions to add points to your cumulative score. Achieve a high enough score to earn a new Mastery Star! 1. Gather Components for the Guardian of Attilan - Collect 50 Guardian Shards (Will Be Used). SPEC OP 13 ONLY! The pieces of the Guardian of Attilan are awarded during combat with Thanos, or can be bought from the store. 2. Assemble the Guardian of Attilan - Research the Guardian of Attilan in the Lab. SPEC OP 13 ONLY! Research for the Guardian of Attilan to complete its construction.